“Interpretations” indeed. As Thornton and Bagby say in the liner notes, “in all the polyphonic sources, the musical notation is reasonably clear and set on a staff with clefs, but uses symbols which are devoid of inherent rhythmic significance. This fact is reflected in our performances, in which the texts themselves serve as rhythmic focal-points and rhetorical guides. The notation of the monophonic songs, in certain sources, is found written without a staff or c-clef, making a reconstruction necessary”. Well, we’ll never know if this is really how this music was performed in 12th century Aquitaine – but it doesn’t matter much. Ultimately, what counts is not historical accuracy (even supposing this accuracy could be firmly established), but the musical pleasure derived by the listener. And once again Sequentia sends you in another world of sublime, contemplative beauty. Texts are about Mary and the birth of Jesus, and track 4 about Saint Nicholas. 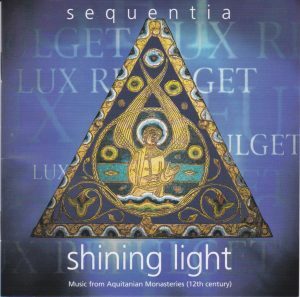 Besides a few monophonic settings, the songs offer examples of early polyphony, two-part (although Sequentia’s rendition makes Lux Refulget, the one that opens the disc, sound like a three-part setting). The recital offers a lot of variety within its apparent “monotony”. It alternates nicely between female and male voices, and intersperses a few instrumental interludes (tracks 5, 8) and a postlude (20) as they would, might, or could have been played in the monasteries (“especially in a celebratory, non-liturgical context”). Some of the polyphonic songs are also underpinned by medieval fiddle and/or rebec (11 male, 18 female). Even in the few monodies (14, 18), Sequentia vary by introducing a solo-chorus responsorial (14) or instrumental underpinning (18). Some of the polyphonies are of the simplest kind (tracks 3, 16, 19), with a bass pedal (I think those were originally known as the “tenor” part, holding – “tenir” – the note) or “vocal drone” as the liner notes call them, usually sung here by choir, over which the upper voice (usually solo, but partly chorus in 19) unfolds its melismatic garlands. All are sung here by men. But the polyphony can be more complex. Track 2, “Verbum patris humanatur” offers the kind of dogged two-part polyphony for men’s voice reminiscent of Leonin and Perotin – underlined by the recurring repeat of the vowels “O-O” and the jubilant refrain “eya nova gaudia” (“hurrah, such are the good news”).But most songs present the free and florid interlacing of two voices, female (tracks 4, 7, 9, 10, 17) or male (6, 11, 13, 15), in which again Sequentia provides much variety by alternating solo and choir. The disc opens with such a two-part female polyphony in which the voices gambol and interlace sensuously in the stratosphere, as an adumbration of eternal bliss. In the poem “Virga lesse floruit” (“the branch of Jesse flowered, flowering it grew radiant”, track 12), the liner notes refer to “a very structured poem [which] serves as a trellis for the intertwining ‘viney’ voices as they curve and curl and ornament around meaning” and that describes it perfectly. If you listen carefully to track 15, it is fascinating how some specific harmonies sung by the two men seem to “buzz”. A contemplative quality emerges from the music, with time flowing very slowly. 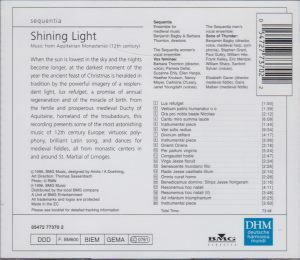 Deutsche Harmonia Mundi published two editions of this disc, one English, “Shining Light”, 05472 77370 2 and the other French, “Lumière”, 05472 77662. 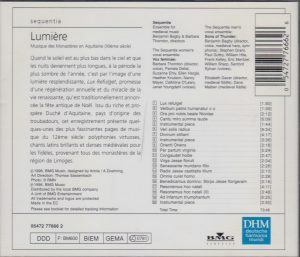 Liner notes come only in French on the latter, they are in English, German and French in the former, but paper quality is (consequently?) better (thicker) in the French edition. Texts of poems and translations provided (in the three languages in both editions). 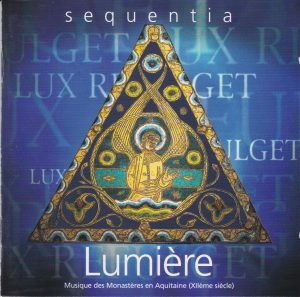 For more recordings of Sequentia, see my Sequentia complete CD-discography.